Purple Leaf Farms: Its Not Too Late! Sign Up For Your CSA Today! Its Not Too Late! Sign Up For Your CSA Today! If you've been waiting to sign up for your CSA share, now is the time. We have 5 more spots available for the season. Get them before they're gone! Purple Leaf Farm's CSA is a 15-week program. You'll receive a combination of veggies and herbs and a large bouquet of fresh cut flowers, all for just $20/week. This year we are also offering the "flexible choice" option which allows you to pick out which items you want in your share! We have drop off locations in Forest Park, UIC campus, Hyde Park (61st Street Farmers Market), the Hines VA Hospital, and of course at the farm in Elgin. Are you tired of throwing out excess produce? 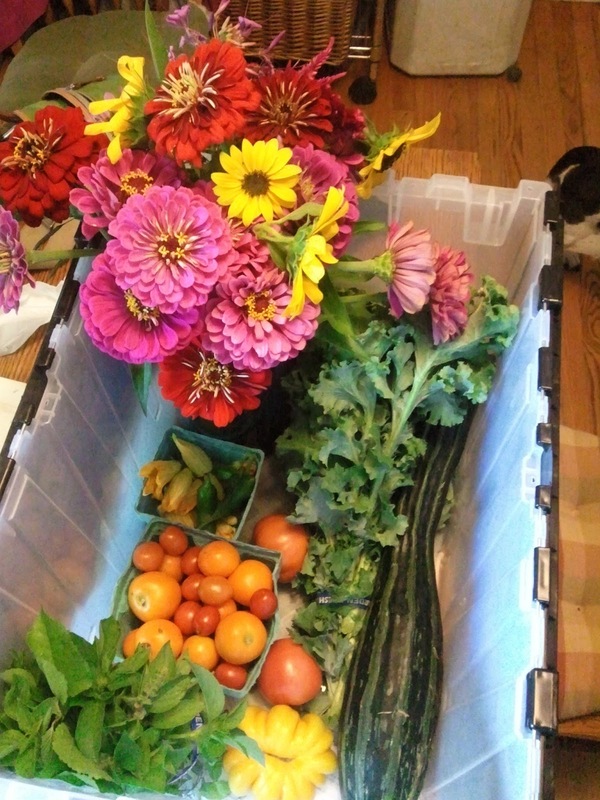 Our CSA boxes are a manageable size for a couple or small family. And with the Flexible Choice option, you can choose exactly which items you get each week. For full details or to sign up, click on the "2014 CSA" tab at the top of the page. Thanks!